Senior linebacker Max Taylor was named the defensive most valuable player and senior Jose Moreno was named first team on offense and defense to highlight the postseason honors for the Beatty High School football team in the Class 1A Southern League. Leo Verzilli/Special to the Pahrump Valley Times Beatty High School football all-Class 1A Southern League honorees at the school with their awards. From left, coach and athletic director Leo Verzilli, Luiz Rodriguez, Jose Moreno, Jacob Henry, Geovonnie Maldonado, Alan Sandoval, Fabian Perez, Efrain Villanueva, Max Taylor. Richard Stephens/Special to the Pahrump Valley Times Beatty senior Max Taylor leaps to intercept a pass against Indian Springs during the Hornets' 38-0 win over the Thunderbirds on Oct. 25 in Beatty. Taylor was named the Class 1A Southern League's Defensive Most Valuable Player by the league's coaches. Jacob Henry, Fabian Perez and Alan Sandoval were honored for both offense and defense, while Geovannie Maldonado was picked for offense and Luis Rodriguez and Efrain Villanueva were chosen for defense. Beatty coach Leo Verzilli said the choice of the 6-foot-2, 210-pound Taylor for defensive MVP did not require any lobbying on his part. While linemen are often anonymous, Verzilli said Moreno made himself obvious on the field on just about every play. Perez, along with Villanueva the only Beatty junior to be honored, was the kind of back who can beat you with both his speed and his hard running, Verzilli said. Perez was named to the second-team defense as a linebacker. With a ground-oriented offense, getting noticed as a receiver isn’t always easy. But Verzilli said Maldonado made the first team offense thanks to his consistency. Henry, the second-team quarterback on offense, earned a spot on the first team with Moreno on the defensive line. While he was stuck behind Da’Juan Brown of Spring Mountain and Preston Higbee of Pahranagat Valley at quarterback, he was another easy choice on the defensive side of the ball, Verzilli said. Sandoval, an honorable mention choice for his play at running back, was a first-teamer on defense. Verzilli said it was because of his ability to excel at whatever an offense threw at him. “Great pass coverage, great run support,” Verzilli said of the outside linebacker. Junior lineman Juan Lopez made the second-team offense, while senior lineman Luis Rodriguez and junior safety Efrain Villanueva were picked for the second-team defense. While the Hornets were well-represented on the all-league team, Verzilli said he was disappointed there was no room on the offense for center James Quirk, a 6-1, 220-pound senior. The release of the all-league team wraps up a strong season for the Hornets, considered the best team in the state not to make the playoffs. But Verzilli knew that would be tough the moment realignment was finalized and Beatty found itself with Pahranagat Valley and Spring Mountain in a division from which two teams would reach the postseason. But the Hornets beat everybody else, mostly decisively, and finished 6-2 for their fourth winning season in five years. League MVP: Da’Jaun Brown, Spring Mountain. Offensive MVP: Malik Powell, Spring Mountain. Defensive MVP: Max Taylor, Beatty. Quarterback: Preston Higbee, Pahranagat Valley. Running Back: Chris Mosley, Spring Mountain; Fabian Perez, Beatty. Line: Kaleb Ducksworth, Spring Mountain; Kyler Martin, Pahranagat Valley; Jose Moreno, Beatty. 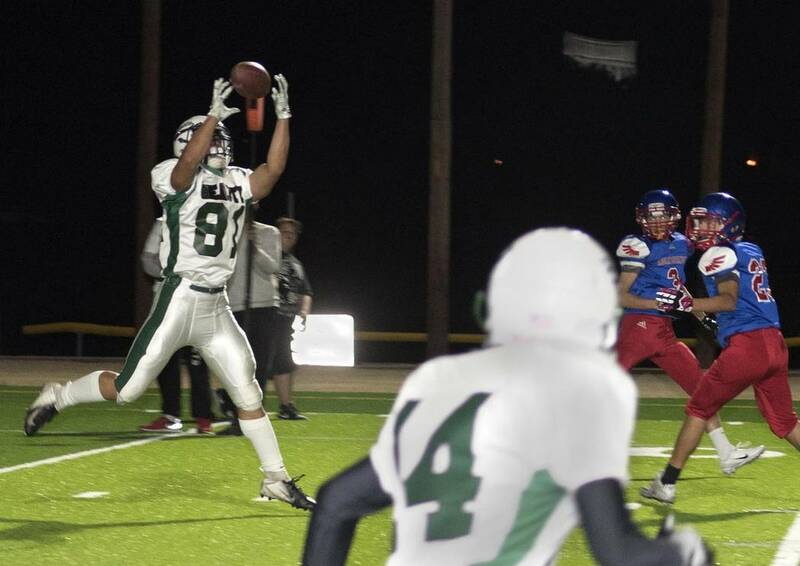 Receiver/tight end: Stockton Maxwell, Pahranagat Valley; Geovonnie Maldonada, Beatty. Line: Jared Ulat, Spring Mountain; Jacob Henry, Beatty; Jose Moreno, Beatty. Linebacker: Kadrieon Payne, Spring Mountain; Alan Sandoval, Beatty; Stockton Maxwell, Pahranagat Valley. Backfield: Chris Mosley, Spring Mountain; Ishad Livingston, Spring Mountain. Quarterback: Jacob Henry, Beatty. Running back: John Hansen, Pahranagat Valley; Jesse Jones, Pahranagat Valley. Line: Lamar Stringer, Spring Mountain; Tayt Leavitt, Pahranagat Valley; Juan Lopez, Beatty. Receiver/tight end: Da’Quawn Samuels, Spring Mountain; Frashauwn Fletcher, Spring Mountain. Line: Kyler Martin, Pahranagat Valley; Luiz Rodriguez, Beatty; Vincent Bush, Green Valley Christian. Linebackers: Paul Lewis, Pahranagat Valley; Logan Hall, Green Valley Christian; Fabian Perez, Beatty. Backfield: Preston Higbee, Pahranagat Valley; Efrain Villanueva, Beatty. Quarterback: Collin Killoran, Green Valley Christian. Running back: Alan Sandoval, Beatty; Talon Smith, Green Valley Christian. Offensive line: Jared Ulat, Spring Mountain; Jon Stewart, Pahranagat Valley; Irvin Soto, Beaver Dam. Receiver/tight end: Traceo Meadows, Spring Mountain; Paul Lewis, Pahranagat Valley. Defensive line: Yashua Prater, Spring Mountain; Jon Stewart, Pahranagat Valley; Tayt Leavitt, Pahranagat Valley. Linebacker: Montrell Smith, Spring Mountain; Zach Gushwa, Indian Springs; Azzario Sepulveda, Beaver Dam. Defensive back: John Hansen, Pahranagat Valley; Jaiden Veltre, Green Valley Christian.